The 4 essential foundations outlined below are key to successful guitar practice for beginners. They should be applied to anyone who wants to learn and should be at the core of all future practice sessions. If you stay true to them, you’ll find that along with your technique, your overall development and musicianship will flourish. As they become second nature, you’ll be able to play with greater ease, have more fun and experience a greater sense of achievement too. The term ‘posture‘ refers to how you sit or stand when playing your guitar. Having the correct posture from the very beginning will be a huge help in developing a great technique. When sitting, try to be as relaxed and tension free as possible in your neck and shoulders and aim to keep your back and wrists straight. Make a habit of using the same chair, it should be without arms, at a height where you can put both feet flat on the floor and be as comfy as possible! Placing the guitar on your right leg is the general method prefered by most right handed players. Keep the guitar upright and close to your body, it shouldn’t lean forward or back. Use your right arm to support the upper part of the guitar’s body and make sure that no weight is being put on the left hand, as it needs to move freely. If you’re starting out on a classical guitar, the left leg will be used to support the guitar and the neck will be angled more steeply as a foot stall is used. This can help with technical playing as it allows for all frets to be easily accessed and helps when difficult finger stretches are used. You can also use this classical posture when playing regular acoustic (steel string) or electric and can be of use when playing particularly large bodied guitars. This way feels familiar playing standing up too, as the guitar will be at the same position once on your feet. To keep consistency between playing seated and standing, try using a strap for both. Adjust your strap when seated so the guitar stays in place when you let go, it should be resting on your leg lightly as some of it’s weight will be supported by the strap. Practice standing using the strap often as this will help when you progress to play in band situations. When listening to music, most people whether musical or not can nod or tap their foot to the beat. 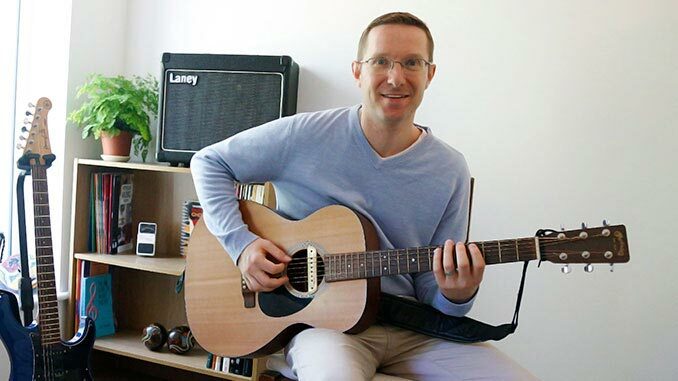 This connection to the music can easily be forgotten once holding the guitar as you can become focused solely on the practical aspects of playing. The pulse of music is what keeps it alive (like your own heartbeat!) and to become a great player you must strive to develop this connection. In music, the pulse is often referred to as ‘tempo’ which relates to the speed measured in beats per minute (bpm). A device called a metronome is used to create a steady pulse of clicks or beeps which you preset to sound at the tempo required. Learning to play along to a metronome will help greatly when practicing. This could be the digital ‘beep’ type or better still a drum machine or backing track. Doing this will improve your accuracy allowing you to play ‘in time‘ along with others which is an essential skill to have as a player. When practicing any piece of music, start off with a tempo which you can comfortably play, with your clearest and most accurate sound. The tempo should be increased gradually to the required speed, making sure the quality of your playing technique doesn’t suffer. When handed a guitar for the very first time, it would be possible to make a sound of some kind, however the note you play will differ from that of a seasoned pro. By having an accomplished technique, the pro will know how to get the best quality sound and tone from their instrument – how hard to pick the strings, how to position the left-hand fingers, good control of the pick etc. This essential principle ties in with the next, that is – ‘personality’ or ‘musical meaning’. When you are constantly striving to play with the best possible sound, even from early on, you want each note you play to resonate with a quality which (once the technique is mastered) then becomes thought-provoking and communicates a message to the listener. Some players put their lack of quality tone down to their equipment, although a closer look can often reveal slips in their technique. Knowing what it takes to create a fantastic tone takes time, which should begin with exploring these 4 foundations. When listening to your favorite guitar heroes, try to figure out what it is about their sound that makes them so appealing. The greatest players have an incredible technique and a highly developed sense of rhythm. They use this to get the very best from their instruments in order to communicate their musical message and they have full control of their sound. At it’s heart, music is a way to communicate a message to the listener. From your earliest encounters with your guitar it’s important to remember this. Playing a note will produce a sound, but playing the same note with the intention of communicating a feeling will give it it’s own personality. One way to achieve this is to experiment with ‘dynamics’ in your playing. Try playing notes with varying levels of volume, from the softest you can to the loudest. What you play will not only sound different in volume but can help convey certain feelings, for example anger (through a loud note) or sadness (through a soft note). Try experimenting with long and short and high or low notes too as this will add interest and bring the music to life. As a beginner you can use simple warm up exercises or make up melodies to try this with. This creative time you have with the guitar is invaluable and by exploring different sounds will strengthen your bond with the guitar. When you improvise as a beginner, anything goes – it’s all about getting a feel for what is possible with the instrument, don’t worry about the notes you’re playing making musical sense at this stage, just use your imagination, create short pieces with titles or tell a story with what you play. Finding the most productive way to practice will vary from one person to the next. Some people will have lots of time on their hands, others not so much – your own personal goals, learning speed and musical tastes will play a part too. Guitar practice for beginners doesn’t have to feel like a struggle or chore, but knowing where to start is key. No matter what you want to achieve from learning the guitar, be it playing for your own enjoyment or becoming the next guitar hero, applying these 4 essential foundations will give you the best chance of developing a great understanding of playing. Keep these in mind to maximise your progress and get the most from your practice sessions. I hope you’ll find this post useful. Please feel free to leave your comments or suggestions below! my son has just started learning how to play the guitar, he only has a cheapy acoustic one, would he benefit more if i spent a bit more money on one or doesnt it matter? Hey Matthew, that’s an interesting question. If your son is serious and wants to learn properly, a higher quality guitar would be a great investment. Not only will it sound better through using higher quality materials and craftsmanship, it will encourage him to play and inspire him more. I would go for the best you can afford within reason, however cheaper guitars can be fine, go with a trusted brand i.e (for acoustic) Fender, Yamaha or Tanglewood. It is very important to ensure the guitar is ‘set up’ correctly which is often overlooked at the beginner stage. Ask your local guitar store to set the action to suit a beginner and make sure they fit a new set of light gauge strings. Often acoustic guitars from the factory have a very large gap from string to fret board which makes it difficult to press down the strings especially for beginners. If he specifically wants to learn acoustic style music stick with an acoustic guitar, if however he wants to rock out look at Squires, Epiphones or Yamaha electric guitars. Electrics are also easier for beginners to learn on. Hope that helps!